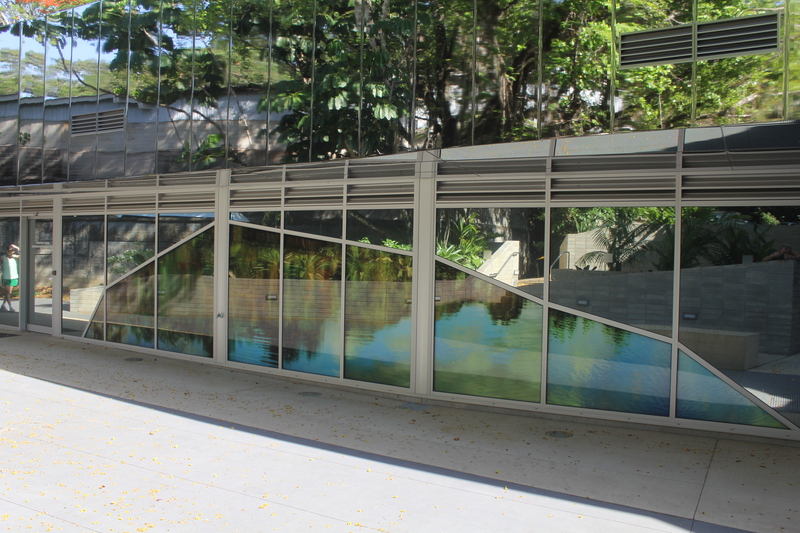 The new visitor centre at Cairns Botanical Gardens is quite literally a reflection of the tropical beauty of far north Queensland. A ten minute drive from the centre of Cairns, the Botanic Gardens are a great place to unwind, and the new visitor information centre is the place to start. The new visitor information centre is a $4.6 million dollar project to revamp the facility and provide an iconic new gateway into the gardens. Designed by Charles Wright Architects and constructed by Hansen Yuncken, the building is a mixed use building, divided into two “wings” separated by a breezeway. One wing houses visitor facilities such as a cafe, gift store and auditorium, while the other functions as office space for council staff and includes a meeting room and administrative facilities. On Friday 16th November 2012 the National MBA Awards were held in Canberra. The Cairns Botanic Garden Visitor Centre was awarded the National Commercial Construction ($5 million to $10 million) National MBA 2012 Award. One of the primary goals of the building was to be “green”, in order to complement the gardens. To achieve this a number of technologies and techniques were incorporated into the design. A big focus was placed on environmentally sustainable design (or ESD). This includes a number of green features such as thermal/solar chimneys which allow convection ventilation and also provide natural light inside the building. The building also features water collection for reuse in both the building and gardens, and a thermal mass system to passively cool the environment and reduce dependence on active cooling systems such as air conditioners. 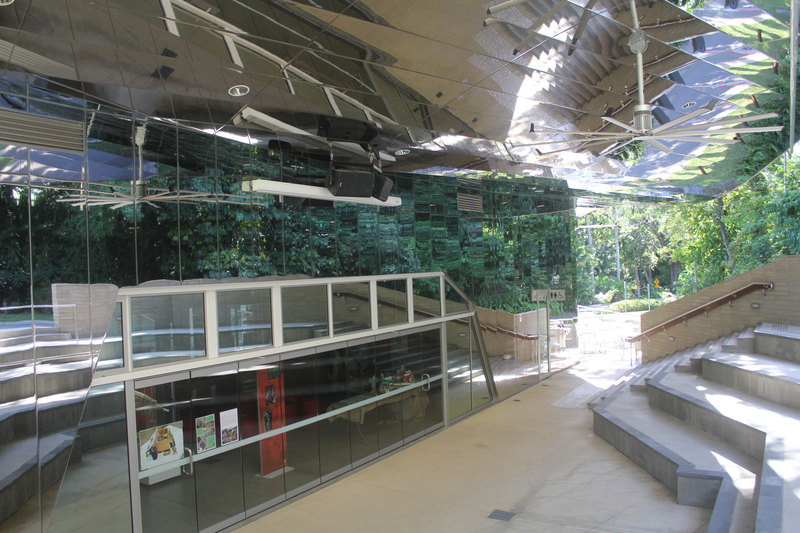 In addition, the visitors wing includes glass stacking doors which fold up completely to allow maximum airflow and open the facility directly onto the gardens. The most notable aspect of the project is the use of mirrors to reflect images of the lush gardens and blend the facility into its surroundings. This was achieved with a reflective film applied to the glass. The lower level windows have artwork printed on the glass using a digital ceramic printing process. 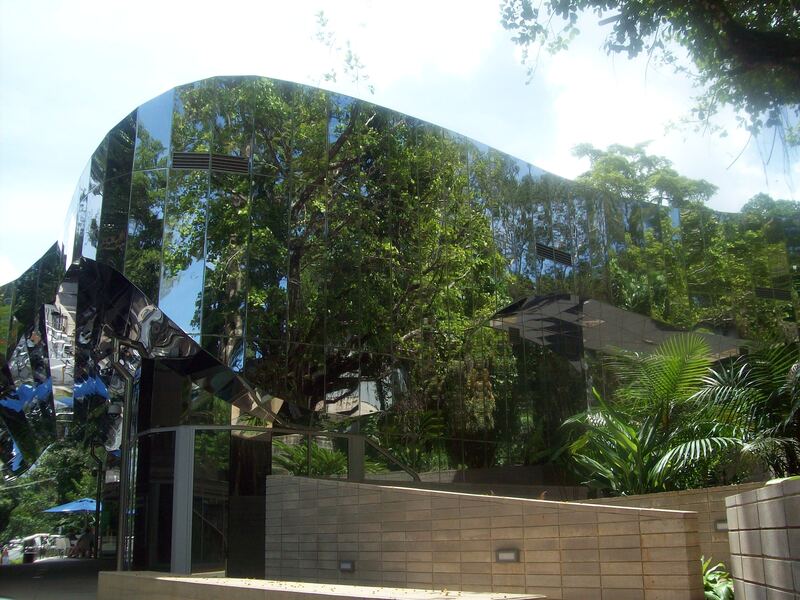 This complements the mirrored glass and brings an aesthetic quality both indoors and out. The Cairns Botanic Gardens area includes the Flecker Gardens, Centenary Lakes, Mt. Whitfield Conservation Park and the Tanks Art Centre. The newly constructed visitor centre offers a great way to explore the area and facilitate community activities, through the auditorium and locally sourced gift shop. The new visitor centre was completed in late 2011 and is open to the public 7 days a week, excluding public holidays. This entry was posted in Doors, Shopfronts, Windows and tagged Shopfronts, stacker doors. Bookmark the permalink. Mirror window and glass are really nice.